Banjade, M.R., Paudel, N.S. and Mwangi, E. 2017. Introduction: Political economy of forest tenure reform implementation in Nepal: Evolution, contestation, outcomes and challenges. Dahal, G.R., Pokharel, B.K, Khanal, D.R. and Pokhrel, P.R. 2017. Why Does Tenure Security Matter in Community Forestry? A Critical Reflection from Nepal. Dhungana, S.P., Satyal, P., Yadav, N.P. and Bhattarai, B. 2017. Collaborative Forest Management in Nepal: Tenure, Governance and Contestations. Ka ey, G.P. and Pokharel, K. 2017. Pro-poor Leasehold Forestry: A Community-based Tenure Regime in Nepal. Thing, S.J, and Poudel, S.P. 2017. Buffer Zone Community Forestry in Nepal: Examining Tenure and Management Outcomes. Gautam, A.P., Bhujel and Chhetri, R. 2017. Political Economy of Forest Tenure Reform Implementation in Nepal: The Case of Protected Forests. Singh, B.K. 2017. Land Tenure and Conservation in Chure. Acharya, D. and Baral, N.R. 2017.Neglected High Altitude Rangelands of Nepal: Need for Reform. Amatya, S.M. and Lamsalm P. 2017 Private Forests in Nepal: Status and Policy Analysis. Wagle, R., Oli, D., Sapkota, B., Aryal, S. and Prajapati, S.M. 2017. 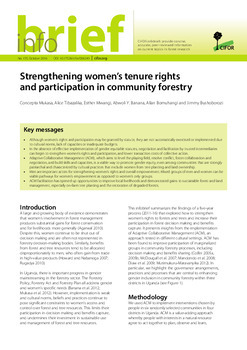 Feminist Institutionalist Interpretation of Forest Tenure Regimes in Nepal.